With some major announcements done recently on partnerships between SAP HANA and Hadoop distributions, there is now a formal channel for Hadoop to make inroads in SAP shops. The 'SAP shop' is an informal lingo term used for captive enterprise organizations which utilize SAP for ERP, SCM, CRM, HR and other enterprise needs. These announcements are probably one of the biggest enterprise push to Hadoop this year besides EMC’s Hawq and IBM’s PureData Systems blitz in the earlier quarters. Within the startup and internet companies world, Hadoop has been used with in-memory technologies in a wide variety of integrated ways which include Redis and Memcached. Certain organizations have used variant architecture where HDFS file system has been used for data storage, Redis for data cache and database like MongoDB for key-value store. However, Redis has still some way to go for enterprise adoption besides current constraints on scalability. Similarly, Memcached has had its own limitations like data loss culpability on node/process restart. 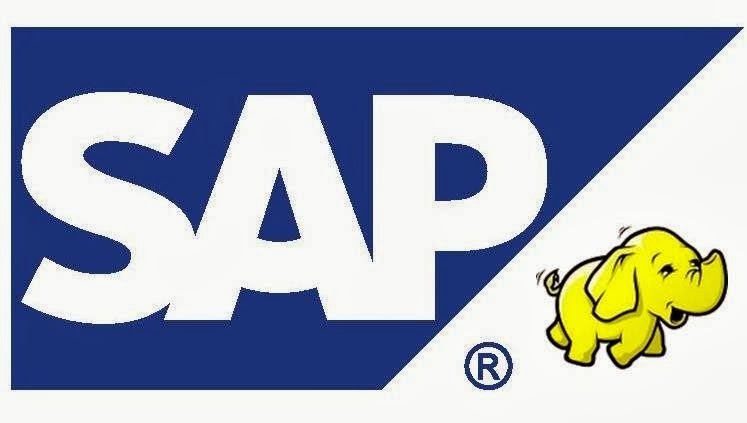 As a symbiotic mutual exchange reward, it is probably this lacuna that SAP HANA aims to exploit within the ardent followers of Hadoop in internet companies. Although not open source or free, SAP HANA has also alongside moved beyond license based usage to cloud based billing and probably can be a bit more appealing to the cost conscious startup world. Beyond the initial hype and confusion which concerned the replacement of RDBMS with Hadoop or replacement of Hadoop with SAP HANA, there is much larger sense of consensus and clarity within enterprise adopters on co-existence of RDBMS, NoSQL DB, Hadoop and SAP HANA. It is now largely accepted that pre-defined schema data fits better in DB which may be relational, NoSQL or in-memory. On the other hand, if the data is largely unstructured and it is better left to programmer or analyst to explore the data, Hadoop may be a better choice. Similarly, data in PetaByte or ExaByte range makes a natural fitment to Hadoop while data less than 5TB would better fit in a DB. One would need to keep in mind that the 5TB range includes metadata, temporary table and buffer size. Price point for lower data volumes makes an appealing cost case for Hadoop while in the higher volume range, you may have to take a prudent call on either of the technologies. Skills is not as much of an issue any longer since most organizations prefer to train their resources and with a period of time, there will be a decent number of folks on the winning products among these technologies. Similarly, within the enterprise architecture, if the organization is using multiple vendor systems for SCM, ERP, payroll, campaign management etc, there is more than a likely chance, the organization would like to consolidate its data in a central warehouse or a Hadoop driven repository. - SAP BusinessObjects, SAP BusinessObjects Explorer and SAP Crystal Reports – for reporting, visualization and building data models. We will keep a watch on enterprise success stories but for now, the merging of both worlds seems to sound like a win-win at both ends.